When wanting to host a New Hampshire meeting with an atmosphere that underlines a commitment to quality and discernment, accommodations at the Bedford Village Inn are the most luxurious and charming in New England. 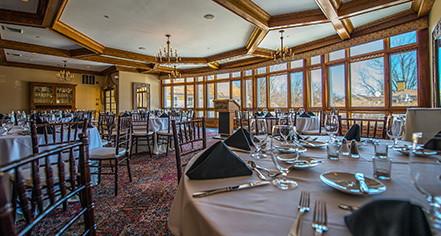 With 8,000 square feet of distinctive event space, the Bedford Village Inn provides an ideal destination for business meetings and small corporate functions here in southern New Hampshire. Whether hosting a seminar for 12 or a dinner reception for 225, hosts will be thrilled with the remarkably appointed New Hampshire venues and modern business amenities, including complimentary high-speed fiber optic internet, audiovisual facilities, and secretarial, translation, and administrative support services. Some venues are also wired for videoconferencing. 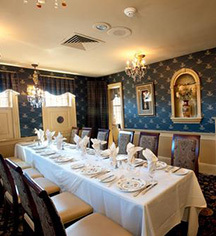 Many of the private dining rooms in the restaurant can be used for small gatherings. The newest edition is the Sycamore Room, an elegant and private conference room, comfortably seats 20, designed for boardroom-type meetings or private dinners. Perfect for intimate dinner receptions is the Overlook Private Dining Room and on a larger scale, the Charolais Room. The Bedford Village Inn will work with the host to cater a corporate function and customize every aspect, from a simple breakfast meeting to a private dinner with wine tastings hosted by the Certified Sommelier. If seeking on-site accommodations, the BVI offers 64 suites, all wired with fiber optic internet access. The Grand Boutique Hotel, the newest addition, features a private business center and fitness facility, in addition to a year-round heated pool and hot tub.